« Chemical Science issue 5 now online! A new family of cobalt-gadolinium cage compounds are highly efficient for low temperature cooling, say European scientists. Liquid helium is currently used to achieve very low temperatures in a large amount of technology, such as super-conducting magnets that are needed for magnetic resonance imaging scanners. But the world supply of helium is falling, making it more expensive. An alternative method for low temperature cooling is to use demagnetisation of magnetic materials. 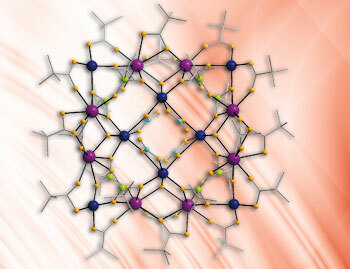 Now Richard Winpenny at the University of Manchester and colleagues have synthesised a new family of cobalt-gadolinium cage compounds, creating heterometallic molecular squares that show potential for the creation of magnetic coolants. Winpenny explains that magnetic coolants work because demagnetisation increases the entropy of the material, and this increase in entropy comes from taking heat out of the surroundings. The highly anisotropic cobalt(II) ions in these compounds would be expected to have an adverse effect on the magnetocaloric effect, according to the scientists, but anti-ferromagnetic exchange between the octahedral cobalt ions appears to cancel out their contribution. To find out more about this ‘cool’ research, download the Chemical Science Edge article for FREE.